When King George VI and Queen Elizabeth arrived in Ottawa for their historic 1939 visit, Their Majesties entered the city through the former Ottawa Union Station, before making their way to Parliament Hill. Eighty years later, the next monarch to visit Canada’s royal-hued Red Chamber will be received not on the Hill, but down the street in what was once Union Station’s bustling concourse hall. Opened in 1912, the beaux-arts train station was, stylistically, a scaled-down sibling to New York City’s Penn Station. When Ottawa’s train tracks were relocated in the 1960s, it was saved by the heritage movement that followed in the wake of Penn Station’s demolition. From 1969 on, the building served as the Government Conference Centre. 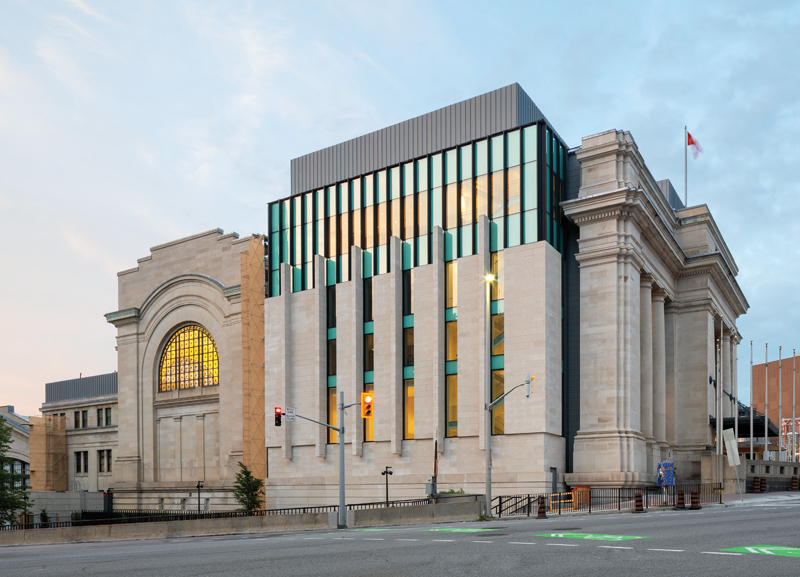 In the past decade, as plans were made for Canada’s main parliamentary building to close for extensive rehabilitation work, the Senate of Canada decided to revitalize this underused and deteriorating heritage site into its temporary home. A new east façade was added to the project, replacing a blank party wall between the former train station and a now-demolished hotel. For the building to serve the needs of the Senate, Diamond Schmitt and KWC Architects’ design needed to address the new program and balance the need for high security with the public functions of the building. It also needed to implement major seismic upgrades, bring mechanical and electrical systems up to code, ensure universal design standards were met, introduce state-of-the-art technology and full broadcasting capabilities, and meet stringent acoustic requirements. The largest physical alteration to the building was the addition of a new eastern façade. The existing blank façade was originally a party wall between the train station and a neighbouring hotel; the latter was demolished in the 1960s. The new elevation is a series of projecting limestone fins, rhythmically echoing the building’s west colonnade facing the Rideau Canal. 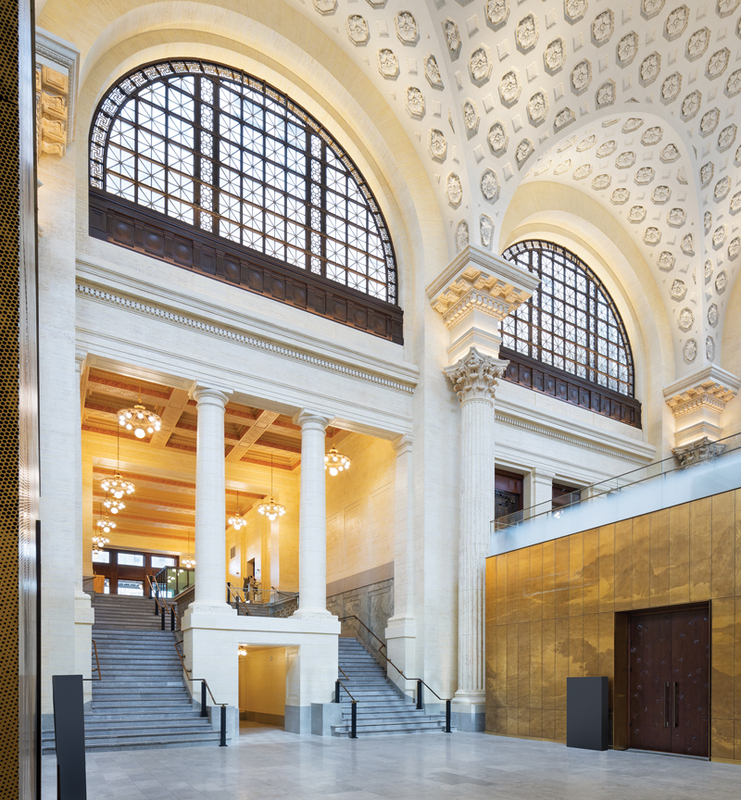 An axial processional route through the former train station leads to the meticulously restored grand waiting area, which now houses two committee rooms. Entering from Rideau Street, dignitaries and visitors proceed south to descend a ceremonial flight of stairs into the former general waiting room—a space whose dramatic vaulted plaster coffer ceilings, cast iron Diocletian arched windows, and marble floors were meticulously restored. While much of the building was stripped back to its original structure to facilitate the extensive upgrade work, the high heritage spaces were maintained and restored using different strategies. For instance, the ceiling in the great waiting room was carefully stabilized from behind while the exposed plaster was restored from below. A senator’s lounge space tops a committee room. Two bronze-fronted committee rooms were inserted into this space, with a new mezzanine level created above. 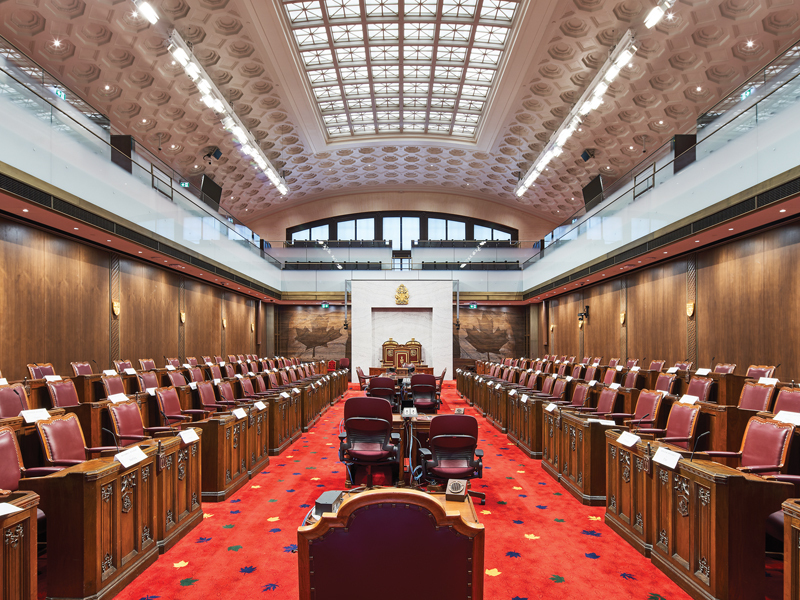 (Overall, forty percent more usable space was added into the project through the creation of the east addition and mezzanine, which includes a third committee room and lounge areas for staff and senators.) Continuing along the axial route, one arrives at the concourse hall, which will serve as the temporary Senate Chamber. Illuminated glass laylight panels were reintroduced above, restoring the concourse’s former airy atmosphere. The Senate Chamber is housed in the former rail concourse. The restoration includes illuminated laylights atop the high-ceilinged space. Photo by Doublespace Photography. The intersection of classical and contemporary architectural zeitgeists is most evident in the building’s materiality and use of ornament. Great efforts were made to retain the train station’s fixtures and finishes. Paint analysis revealed the original multi-layered colour scheme of the faux travertine, long since overpainted, and the effect was carefully replicated. In contrast, the new elements are complementary in style, but use materials intended to endure, including solid walnut, bronze and cast glass. These contemporary materials act as canvases for modern interpretations of beaux-arts ornamentation. Outside of the three committee rooms, perforated bronze acoustic screens render archival photographs of Canadian landscapes in a half-tone dot matrix pattern, with spots of varying diameters. 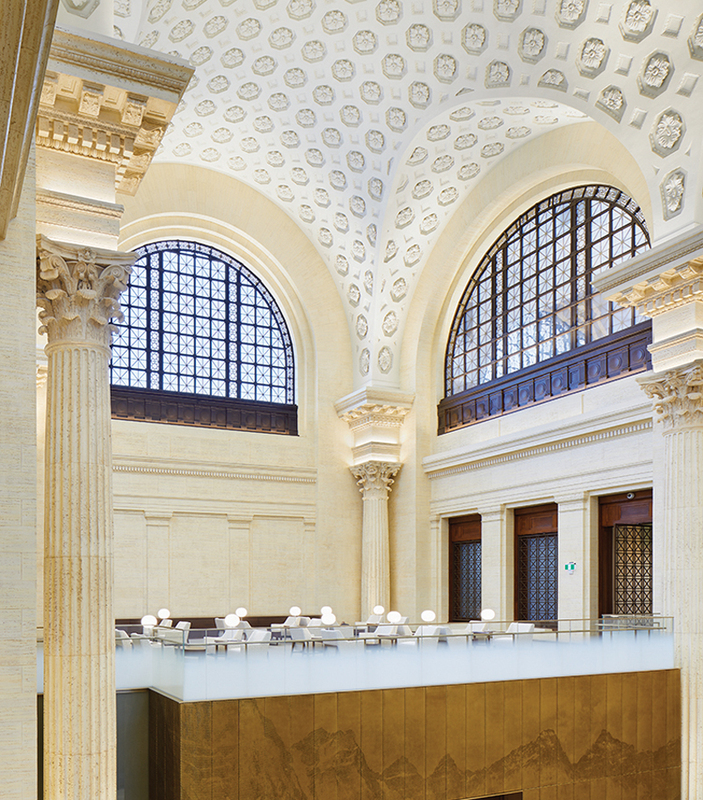 The images, selected by the architects to commemorate the building’s original use and symbolize the senate’s duty to Canadians from coast to coast, include Newfoundland’s Cape Race, Alberta’s Banff National Park, and a train crossing a trestle bridge on Vancouver Island. 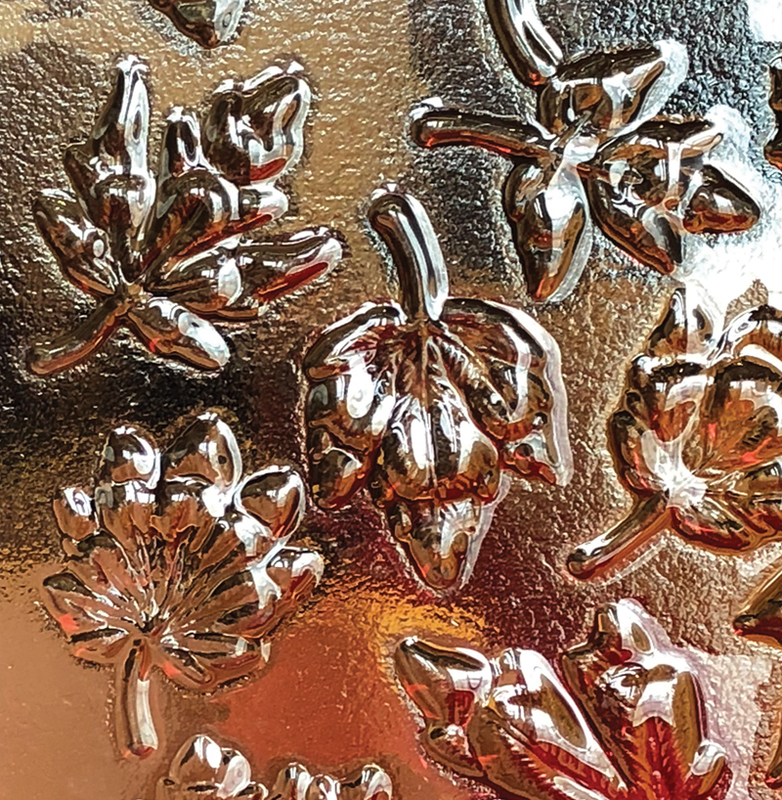 Cast glass panels include maple leaf motifs that were digitally scanned from hand-sculpted originals by Dominion Sculptor Phil White. Photo by Martin Davidson, Diamond Schmitt Architects. Depictions of the maple leaf—represented in all ten species native to Canada—can be found carved into the committee room doors, cast into Senate Chamber partitions, and woven into carpets in a pattern that increases in density as one proceeds to the Chamber. “Our interest was to use art and the craft of making in a modern way, to embrace an idea of a Canadian identity that may resonate with all of us,” says Davidson. Combining traditional and digital tools was another unique aspect of the project. To this end, the project involved both Phil White—the Dominion Sculptor of Canada—and Carleton University’s Immersive Media Studio (CIMS), under the direction of Dr. Stephen Fai. The many maple leaves that adorn the building, for instance, were first drawn by Diamond Schmitt, then hand-sculpted by White. CIMS made 3D laser scans of the carvings; these digital drawings were composed into panels by the architects, and finally carved from walnut by CNC milling machines. High-density 3D moulds created from the scans also formed the initial step in the process of creating ceramic moulds used in fabricating kiln-fired slumped glass panels for the Antechamber. Wooden flags flanking the Speaker’s chair were carved using a digitally manipulated method to create the illusion of movement. Photo by Doublespace Photography. A hybrid of hand carving and computer work was also used to create the provincial and territorial shields that line the Senate Chamber walls. The shields are exact replicas of the ones that adorn the walls of West Block, but at two-thirds the size in order to accommodate the rhythm of the pilasters in the new Chamber. The originals, which were hand-carved by White, were digitally scanned and then robotically milled at the reduced scale. White carved the final details by hand and gilded the shields in 24-karat gold leaf. 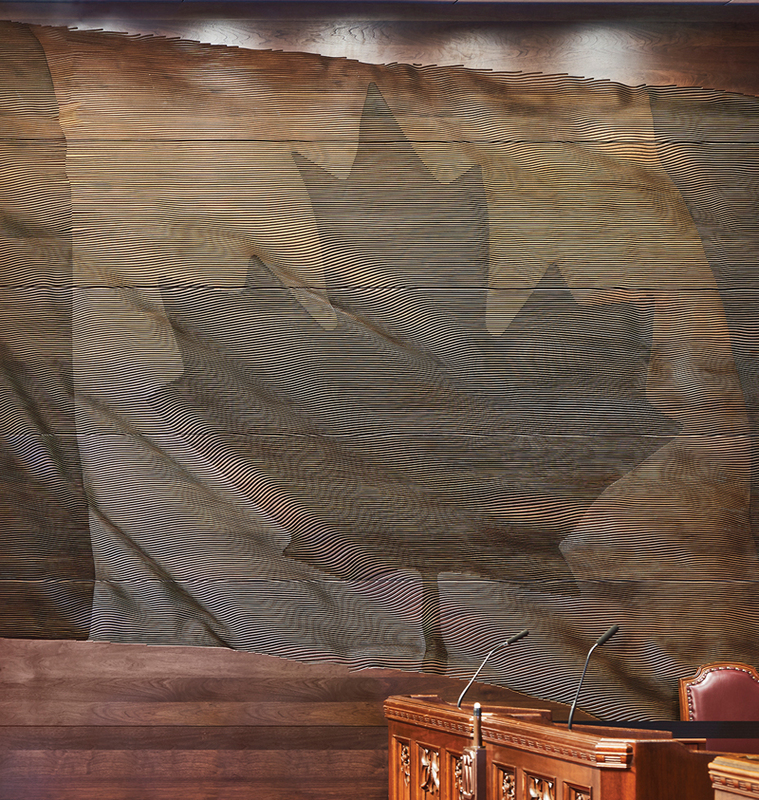 Two wooden Canadian flags in the Chamber were created using a digitally manipulated method of carving wood panels: the pitch of the cutting head was varied to mimic movement and depth, creating the illusion that the flags are fluttering. Thus, while the future use of the building is not yet known, what is certain is that it will have a future. That is due in equal part to those who fought to save the building from demolition back in 1967, and to the critical restorative work completed in 2018. Fifty-one years apart, they are both important intersections in the life of this Ottawa landmark. Ottawa-based Kristen Gagnon is the architecture editor of Spacing.